Createspace Independent Publishing Platform, 9781500302573, 226pp. Why must Lord St. Evert dress like an overdone Dandy? His outlandish wardrobe belies his powerful build and the hard unyielding lines of his face. Whoever he is, he's ruining Elizabeth Hampton's desperate scheme to secure a much-needed rich husband. Terribly vexing, to arrive at the most fashionable Breakfast Party of the Season wearing a perfectly stunning Chinese silk gown, only to discover Lord St. Evert is clad in unmentionables cut from identical cloth. Lord St. Evert despises pretension of any kind. He cannot abide the self-important airs put on by some members of the Ton and takes pleasure in making a mockery of Brummell's fashion strictures. Conceited frauds Hadn't his grandfather's snobbery made his mother's life a misery? All the more maddening to discover that the one woman who captures his interest is the biggest pretender of all. He vows to teach Miss Elizabeth Hampton a lesson she won't soon forget. 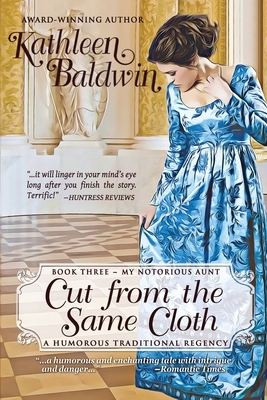 If you love tongue in cheek humor, spies in disguise, and the wry humor of an Oscar Wilde play you won't want to miss Kathleen Baldwin's Notorious Aunt series.